Clutter is a sneaky culprit when it comes to disorganization and discomfort. It can lurk in any closet, corner or drawer and takes on many different forms. Everything from clothes, electronics, papers, and collectibles, to household necessities, can clutter your home and your life. If you go to Weight Watchers they will ask you “What do you think is the most effective exercise?” And no matter who you are the answer will be “The most effective exercise is the one you will do.” Treat Clutter Clearing with the same intent you would a new exercise program, as on ongoing undertaking that requires a commitment to yourself. Before you begin clearing your clutter, remind yourself what purpose it is serving and set your intent to put out the vision you have for your home and see this as a step along the way to creating it. Getting rid of things you don’t need or aren’t using is a symbolic act of releasing what you don’t need in your life. The physical is connected to the deeper levels of our being, and the simple act of clearing out your clutter can be one of the most spiritual experiences you can have. Start to identify items that have lost their beauty, their function or their value to you. Begin with a box or many boxes to put your purges in. Be open and creative, there are many possible destinations for your purge items. Recycling, donating, selling and giving away are easy options for many items. Those things you can’t quite let go of is where your creativity comes in handy, relocating, re-purposing and re-furbishing are always options. Maybe grandma’s dresser goes to the attic to store holiday decorations, to the garage to hold tools, or to the living room to hold art supplies, instead of housing 300 pairs of unmatched socks in an already crowded bedroom. Perhaps your collection of vintage tin containers gets dismantled and distributed throughout your home to be used for organized storage. Leaving you with an open shelf and the opportunity for new organization of something else. If you’re still having difficulty purging, start a maybe pile to be reconsidered down the road. Group like items together it will be easier to assess what you have, purge and organize. Of course this can be done many different ways, experiment with what works best for you. Do you hang all short sleeve blouses together, or all brown tops together, or all work clothes together? As you purge and reorganize you will find it necessary to create and implement new storage solutions. When your purging keep this in mind and save any possible storage containers. 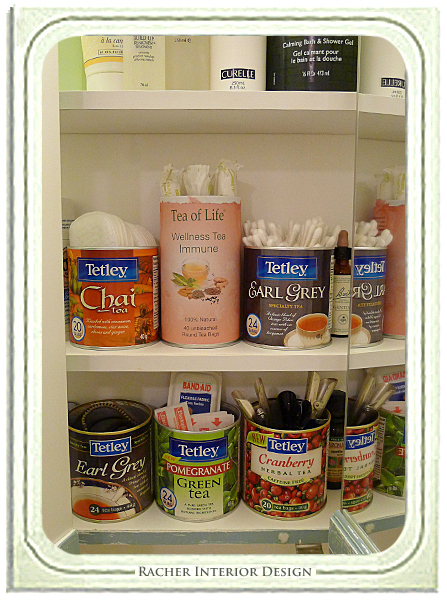 Maybe your old canisters can be used for storage of something other than food? 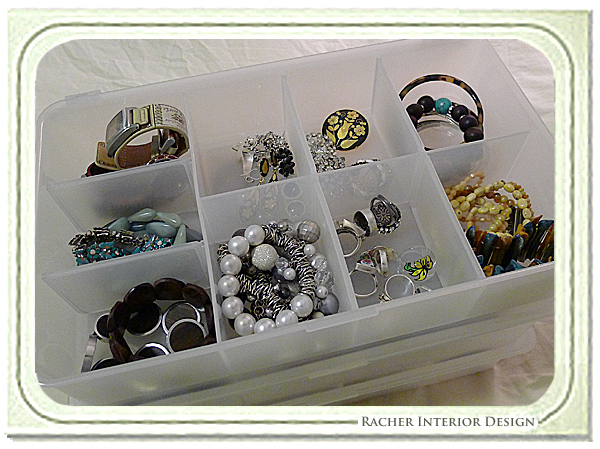 Be creative when it comes to storage containers and solutions. If need be implement makeshift containers until you come across a better solutions. Find a storage space for every item you own, whether it is decorative or not, visible or concealed within a closet. Think of convenience when selecting storage space. Put the items you use most often in the most convenient spots and the less frequently used items further back in the closet. This sounds like simple advice, but if you really think about it and look in your closets, drawers and cupboards, you might be surprised at what you find where. De-cluttering is the perfect opportunity to clean as you go. Remove empty drawers and move furniture cleaning under and around. Wipe out drawers before you put the contents back in. As you clean from drawer to drawer, and room to room keep the areas you have cleaned and purged, organized and free from clutter. Enjoyment of those spaces will keep you motivated and moving forward. You need to be conscious of staying on track. If you start washing the windows and dry cleaning the drapes you will lose momentum. Make notes of the tasks you would like to go back and tackle, once you have completed the clean sweep of your home, and dealt with the removal of all your collected clutter. If you are finding it difficult, do it one small section at a time, or you could be overwhelmed. 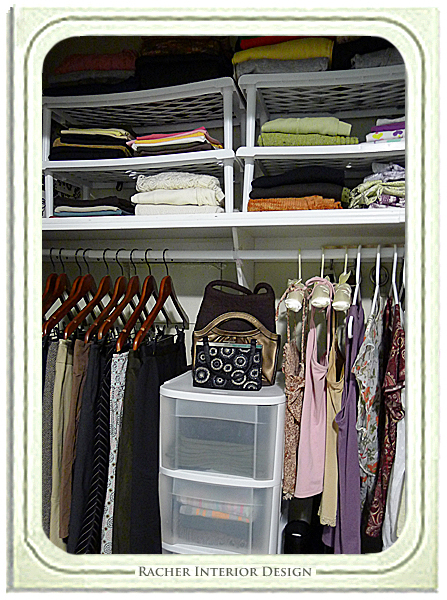 Start with one area of your room, the drawers in your desk, or a closet. Dedicate a few hours to sorting through the clutter in one spot, take a break and move to the next area. Once you complete the task of purging, cleaning and reorganizing an entire room or closet, light a candle or incense and take a moment to sit in the space and enjoy the rewards of your efforts. As you discard, donate, recycle, and sell the fruits of your purging, observe the feelings associated with releasing, and the accomplishment you feel in relation to the sheer volume of clutter removed from your home. Notice how much better you feel! Like a breath of fresh air, you have allowed space for new energy that is in alignment with the vision you are creating. This too will keep you moving forward and encourage you to stay organized. Continually rearrange and reorganize your belongings, if something isn’t convenient keeping it organized will become a chore. The areas of your home that are not working for you will be easy to recognize, as they will be the first place clutter begins to collect. 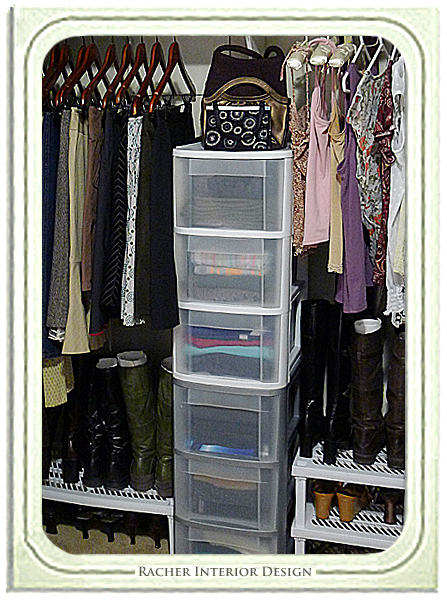 Reevaluate and reorganize how you store your belongings when they start to get disorganized. 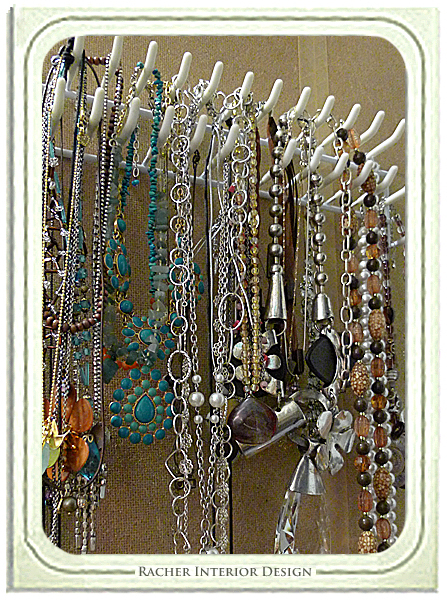 The more organized you are the easier it is to rotate seasonal items. Is your front hall closet jammed with summer and winter coats year round, while your guest room closet goes basically unused? Lighten Up: Free Yourself from Clutter, Create the Space for Miracles by Freeing Yourself from Too Much Stuff, by Michelle Passoff. This book focuses on the process of clutter clearing with regards to different kinds of clutter including an in depth section on paper clutter and filing. 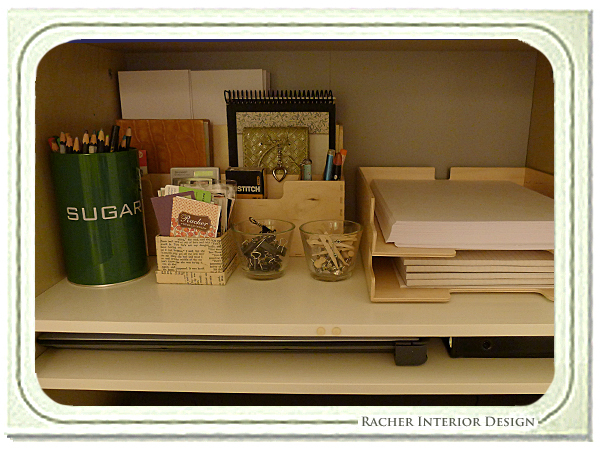 Organized Simplicity: The Clutter-Free Approach to Intentional Living, by Tsh Oxenreider. This book focuses on living simple, budgeting time, activities and money. You will find checklists and worksheets as well as recipes to make your own cleaning products. Soul Coaching: 28 Days to Discover Your Authentic Self, by Denise Linn. This book is a spiritual journey divided into four sections (Air – Mental Debris, Water – Emotional Self, Fire – Spiritual Self, Earth – Physical Self) with daily assignments. Chances are clutter clearing is not something you can accomplish in a day. Break it up into bite size chunks and schedule times to de-clutter. Whatever your approach is make it enjoyable, listen to music, have a glass of wine or a cup of tea while working away. If you are still feeling overwhelmed with clearing your clutter, it could be an indication of deeper emotional issues. Deanna Strandquist of Wind Haven Consulting would be happy to help you work through those emotional issues from an energetic view. If you are struggling with how to go about it, Stacy Racher of Racher Interior Design can consult with you to get you on the right track. This entry was posted in Creating a Sanctuary, Energy Medicine and tagged clearing your clutter, Creating a Sanctuary, Racher Interior Design, wind haven consulting. Bookmark the permalink.